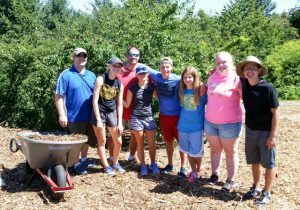 On a hot summer day we welcomed St. John Lutheran Church from Fargo ND to our summer outreach at the Meadowbrook Community Gardens and Orchards (MCGO). The group comprised of two chaperones’ (Pastor Brian) and youth visiting the Pacific NW. 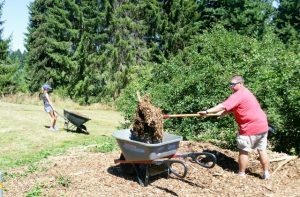 The mission group spent time serving in Puget Sound region and one of the locations they chose was MCGO! We appreciate very much the time and energy the group gave to our local project. They also served downtown Seattle and out at Whidbey Island social service agency, as well. The weather was a little too warm but water and shade were in abundance. The focus of the day was the East Orchard. 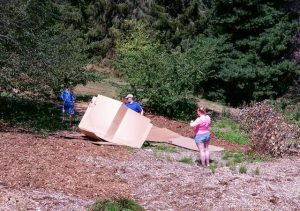 With harvesting already complete, the group worked on mulching the existing community orchard. Before starting the service, a tour of the community gardens along with the full scope of the orchards was also offered up for them to see. Tasting the elderberries and other available fruit were also part of the experience. 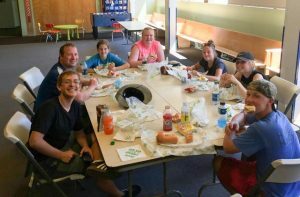 After knocking out the mulch and cardboard, the group got together for sit down lunch at the Maple Leaf Lutheran Church in Meadowbrook. We appreciate the time and thanks to all for their offering of support for MCGO. Load up and move out.. Team work and good vibe.